Microsoft Access databases are often created as a temporary solution, but end up becoming a heavily used legacy application. As years pass and the data contained in the database becomes larger and more integrated with daily operations, a more robust database is needed. To avoid heavy licensing costs imposed by SQL Server and Oracle, MySQL is often used to fulfill this requirement. 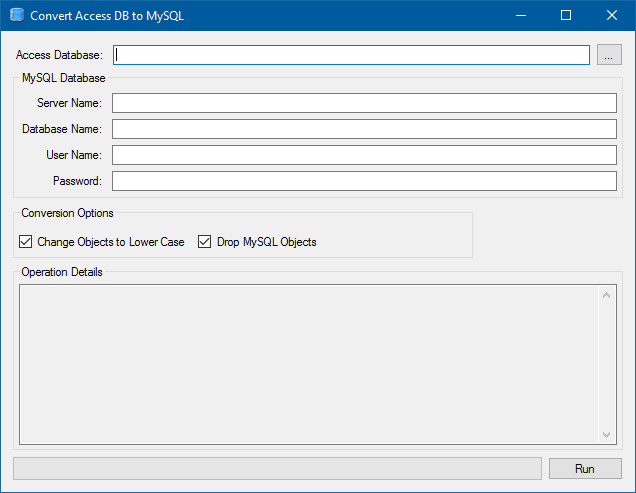 The Microsoft Access to MySQL conversion utility is a custom developed program used to copy a Microsoft Access database to a MySQL database. This utility has assisted in migrating many slow running Microsoft Access databases to MySQL, often accompanied by a new application. This application quickly copies table structure, data, indexes and constraints to a destination MySQL database. If you would like to migrate from one database management system to another, call us or send us a message.